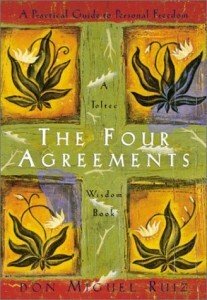 A couple of weeks back, a friend recommend “The Four Agreements” by Don Miguel Ruiz to me. And I am surprised with the effect reading this work had in my life. This book will truly change your life, if you apply the learnings properly. When you seriously analyze it, you will realize how powerful language actually is. Ruiz calls it “the gift that comes directly from God.” It has the power to create – and to destroy. It can create visions, make dreams come true – and ruin whole nations like Hitler, Mao, and Pol Pot have taught us so drastically. It was all because of the word. “Impeccability means without sin”, and “a sin is anything that you do which goes against yourself”, e.g. judging or blaming yourself. “Sin begins with rejection of yourself”. Fascinating point to ponder, isn’t it? I invite you to watch your word for the next seven days. Pay attention to what you say. When you get up in the morning, stand in front of the mirror and say it out loud: “I am impeccable with my word”. Observe then critically throughout the day how many times you will be tempted to join the people around you gossiping and complaining. Do not join them spreading the poison. Observe how people around you use their words at your workplace. Listen to how people deal with each other in TV shows. If you do this thoughtfully and consequently, I promise, your perception of the world will change in one week. I am looking forward to having you share your experience with me.